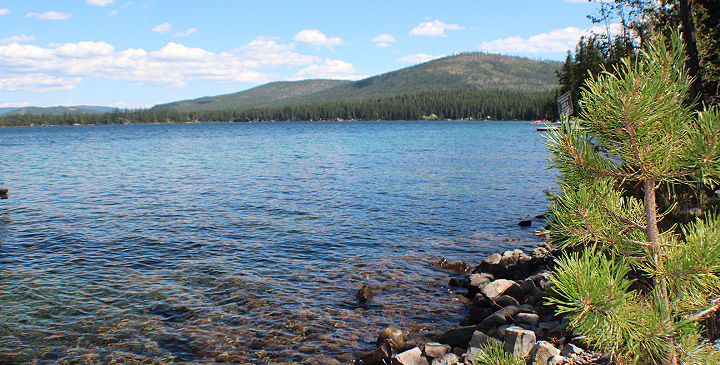 McGregor Lake is at an elevation of 3,998 feet and is an easy 40 minutes drive west of Kalispell, MT on Hwy 2. This long lake’s north boundary runs along Highway 2, so there is easy and quick access to real estate on that side of the lake. Private property also runs on the east and southeast shoreline. The lake is about 1,521 acres in surface area with an average depth of 106 feet and a maximum depth of 220 feet. Because McGregor is quite deep and remarkably clear, it has been a favorite of local scuba divers who can practice there. A large portion of McGregor Lake’s shoreline and surrounding acreage is owned by the State of Montana and so remains undeveloped forest land, most of which is on the south shore. This fact has kept the population on McGregor very low. Recreational boating on McGregor Lake includes a mix of water skiing, fishing and canoeing with a nice public fishing access with boat ramp on the west side. The Montana Fish Wildlife and Parks department has additional information on their website about McGregor Lake, part of the Thompson Chain of Lakes. Real estate property values on this scenic Montana lake have been steady over the last several years.